Posted: Friday, May 13, 2016. 12:31 pm CST. 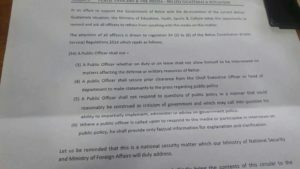 By BBN Staff: A memorandum issued on Monday by the Ministry of Education, Youth, Sports and Culture’s Chief Executive Officer, cited parts of the constitution which informed all public officers that they are not to give media interviews on anything relating to the Sarstoon issue, or our country’s defense resources. It states that in an effort to support the government in its attempts to de-escalate the Belize/Guatemala situation, the ministry is reminding and asking all public officers to refrain from speaking to the media on that matter. (3) A Public Officer whether on duty or on leave shall not allow himself to be interviewed on matters affecting the defense or military resources of Belize. (4) A Public Officer shall secure prior clearance from the Chief Executive Officer or head of department to make statements to the press regarding public policy. (5) A Public Officer shall not respond to questions of public policy in a manner that could reasonably be constructed as criticism of government and which may call into question his ability to impartially implement, administer or advise on government policy. (6) Where a Public Officer is called upon to respond to the media or participate in interviews on public policy, he shall provide only factual information for explanation and clarification. It ends by reminding officers that this is a national security matter which the Ministries of National Security and Foreign Affairs will duly address.